By the Georges, she’s got it. There’s an intangibility to the first Georges. Not as personages — the beefy, music-loving, German-speaking George I is fully tangible — but as aesthetic presences. What did they bring to art’s party? For what should we thank them? While the “Georgian era” itself is celebrated for its architecture and its music — well, for Handel — the actual contribution of its name-givers is foggy. To resolve these mild aesthetic disputes, and to celebrate the 300th anniversary of George I’s ascent to the British throne, the Royal Collection has mounted a lively investigation of Georges I and II. Everyone knows that George III was a big hitter in British aesthetics, and that George IV was a dissolute dunce. But were their predecessors as lumpen and inert as we casually assume? As with all such displays at the Queen’s Gallery, the show is a mix of sumptuousness and sumptuousness, with some sumptuousness thrown in. But there is also, once again, a vigorous contribution from proper scholarship, and the result is a far more educative event than we might have expected. We start with a roomful of portraits whose task is to put a royal face to the royal name. George I, painted by Godfrey Kneller, attempts an imperial pose. On his back: a suit of armour. Around his neck: a purple toga. About his shoulders: a cascade of grey ringlets. But — and I think this is not only his secret, but the secret of his entire clan — the face framed by the cascading ringlets has something of the pork pie about it, a basic Hanoverian inelegance that no amount of purple swathing will ever fully ennoble. 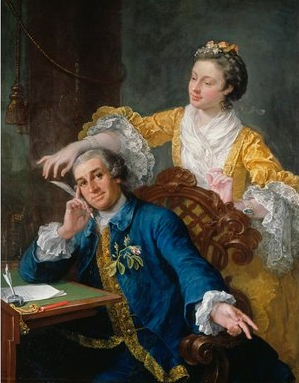 Further along in the Georgian era, when we get to Gainsborough and Reynolds, British portraiture was to reach new heights, but those developments lie outside the limits of this event. Here we get Kneller painting Queen Anne and Rysbrack sculpting George II: dutiful royal likeness-making, untouched by genius. Much the same can be said of the show’s next concern: architecture. In the field of palace architecture, the achievements of the first Georges were practically invisible. The burning down of Whitehall in 1698 had left them with no proper palace to rule from. (Buckingham House had not yet been acquired.) But instead of ambitiously replacing Whitehall, they chose instead to squeeze themselves into the modest Tudor spaces of St James’s Palace. Or so it seemed from the outside. On the inside, in the suites of royal picture galleries created behind the Tudor walls, and in the royal attention paid to the career of William Kent, the first Georges turn out to have been secretly lavish. Conscious of their foreignness, however, sensitive to the mood of the land, they didn’t want it to show. All this is interesting, but not yet pulse-quickening. A section dealing with Hogarth’s agitation for a new copyright law, and the Hogarthian prints that illustrate it, maintains the black and white atmosphere of these opening arguments. But, just as the cobra slides quietly through the undergrowth before rearing to strike, so exhibitions at the Queen’s Gallery often have a modest initial presence before coming around the corner into the central spaces, where they unleash their true nature. That’s what happens here. It isn’t just the paintings acquired by the first Georges — three huge Rubenses, a couple of the best Holbeins, a deathly beautiful Cleopatra by Guido Reni, a cluster of Claudes — that make the central gallery so alarmingly exciting. It’s also the furniture, the clocks, the jewellery, the diamond-encrusted miniatures. You would have thought that after all the shows that have now taken place at the Queen’s Gallery, we would have a good sense of everything the Royal Collection contains. Do we heck. At every event, they reach into the attic and pull out another box of goodies. The reigns of the first Georges also coincided with the emergence of an enlightened new attitude to nature, and in George II’s wife, Queen Caroline, the royal family found itself with an enlightened monarch in its midst. In a show full of distinctly ordinary portraiture, Joseph Highmore’s portrait of Caroline offers a rare moment of sensitivity. She was the first royal to have her children inoculated. She can also claim some credit for the thorough education of George III, who bought the two glorious views of the Thames by Canaletto that light up the final room. Her husband was less impressed by her enlightenment, complaining that she spent her time “more like a school-mistress than a queen”. The establishment of Kew Gardens was another early Georgian achievement. So was a spectacular natural-history library filled with coloured beasties from the pioneering days of the genre. The new interest in natural history also influenced the ceramics of the era. A set of exquisite Chelsea plates decorated minutely with scientifically observed flowers and moths is a beautiful reminder of the close relationship that existed in early Georgian aesthetics between science and gewgaws. An even more spectacular example of this union — and for me the highlight of the show — is the golden dinner service assembled from various Lucullan masterpieces created for the early Georges by the finest silversmiths of London. Spoons by Paul de Lamerie. Plates by George Wickes. Dishes by Edward Wakelin. And, in the middle, the single most gorgeous piece of silver gilt I have ever seen: a centrepiece by Nicholas Sprimont, featuring Neptune on the top and all manner of cheeky nautical wildlife scuttling about the base. This biological silver is worth the entrance fee on its own. Once again, the Queen’s Gallery has brought us a delightful mix of treasures and knowledge. What a relief, too, to visit a straight-talking exhibition, so marvellously free of curatorial cant. Is there any chance that a change in the constitution might make it possible for the Royal Collection and its curators to take over Tate Britain?